The go-to payment solution for the legal industry. For more than a decade, LawPay’s online payment technology has been trusted to help law firms get paid easier, more securely, and 39% faster. More importantly, LawPay guarantees your firm accepts payments in compliance with ABA and IOLTA guidelines. LawPay is available through all 50 state bars, 60+ local and speciality bars, and the ABA as a vetted and recommended payment solution for the legal industry. Thousands of law firms benefit from the experts at LawPay. No one has more knowledge and experience in legal payments. The legal payment technology integrated with most major practice management solutions. More options to help build your practice. A session on the specific duties of the lawyer in cases that involve high client emotions and conflict. LawPay's easy-to-use online payment technology was developed just for lawyers. No debits are allowed from your IOLTA, at any time for any reason, guaranteed. 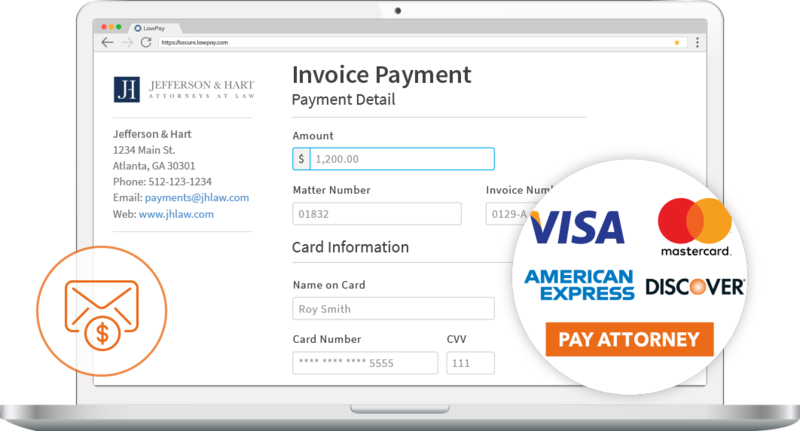 Simply put, no online payment processor has more experience helping lawyers than LawPay. Why trust your payments to anyone else? With LawPay, you can attach a secure payment link to your email, website, or invoices so that clients can pay you at their convenience from their computer, cell phone, or tablet. Personalize your payment pages with your law firm's information and logo to give clients a familiar, secure point-of-payment. Join the 50,000+ lawyers that see the benefit in LawPay! Five-star service, and unsurpassed technology.